Hiking boots, rain pants and an umbrella and off to Relay for Life on a rainy Friday night. 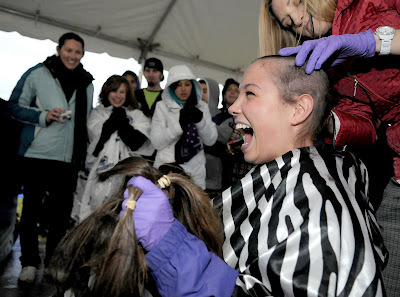 Great job to all those who braved the weather and still participated in the event with so much energy and enthusiasm. 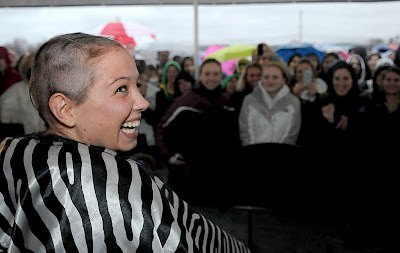 The specific story I was covering was on a girl who said if she raised $1000 dollars she would shave her head. Her mother is a cancer survivor, her cousin lost her battle with cancer, and her best friend was recently diagnosed. 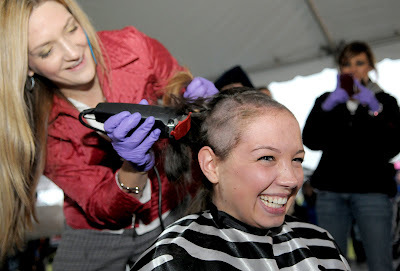 She received over $1000 in donations, and despite her mom's offer to donate another $1000 for her not to do it, she shaved her head on stage as a crowd of relay participants, friends, and family cheered her on.